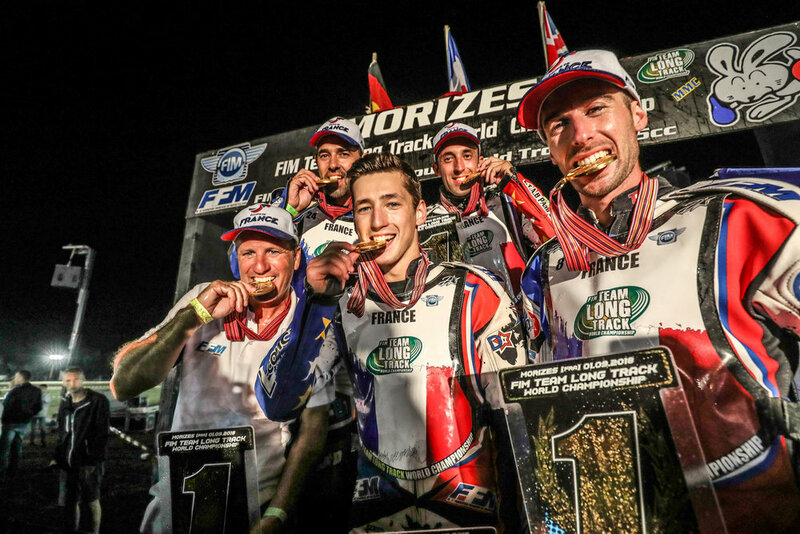 Riders from six countries did battle for the FIM Team Long Track World Championship in 2018, with France coming out on top of a thrilling event in front of their ecstatic home fans in Morizes. Teams of three riders, plus a reserve, over 15 heats to decide the destination of the Don Godden Trophy, with the French team living up to their billing as the pre-event favourites with a comfortable eight-point winning margin over Great Britain. 2017 winners Germany, who had won eight out of the eleven previous finals, had a significantly weakened team for this year with Martin Smolinski unavailable, Michael Härtel and David Pfeffer both injured and the out-of-form Stefan Katt giving his place to one of the younger riders. With Dimitri Bergé and Mathieu Trésarrieu both in contention for the individual championship it was easy to see why France were so well fancied and they did not disappoint, taking a crucial 10-5 win over the Brits when they met in Heat 2 and never looking likely to lose their lead. Great Britain last won the competition in 2015 and their second place was well earned with both James Shanes and experienced captain Chris Harris scoring heavily, whilst the depleted German team were very happy with their bronze medal place after the selection problems that had surrounded Team Manager Josef Hukelmann. The Netherlands also had injury problems with Romano Hummel and Henry Van der Steen both out, putting the pressure on Theo Pijper, whose 20 points were just not enough to lift them onto the podium as they finished four points adrift of third place.